It's a Tuesday...how about some booze? Today's post is for Halloween Jello Shots. When I started this website, I never imagined I'd stumble upon a muffin pan recipe that involved alcohol! I mean most recipes I figured would be baked. The occasional frozen treat but never booze. And Halloween themed? I'm in love. So here it is. The illusive, special, halloween themed, booze-laiden muffin pan recipe. 1. In a medium bowl, add 1 cup of boiling water to the package of lemon or pineapple gelatin. Stir for two minutes until the gelatin is fully dissolved. Stir in 1 tablespoon of sweetened condensed milk until mixture is even and creamy. Stir in 1/2 cup cold vodka (or ginger ale) and stir until mixture is even. 3. Pour the gelatin into each of the wells of the mold. Refrigerate for at least six hours or overnight to allow to set. 4. Unmold the gelatin shapes by filling a sink, basin, or large bowl with warm water. Dip the mold just to the rim in the warm water for about 10 seconds. 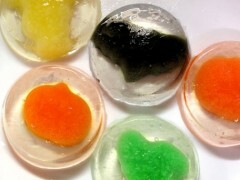 Lift from water, hold upright, and shake slightly to loosen the gelatin from mold. Place a cold, moistened plate over the top of the mold and invert the plate and mold together. Carefully lift the mold, if gelatin does not release dip the mold in warm water and try again. 5. In a medium bowl, sprinkle 2 envelopes of Knox evenly over 1/2 cup cold water and allow the gelatin to absorb the water for 2 minutes. Stir in 2 cups boiling water for 2 minutes until the gelatin is completely dissolved. 6. Stir in 1 cup of sugar until fully dissolved. Refrigerate the mixture until it cools and begins to thicken. 7. Place the gelatin shapes face down in the bottom of each well of a large muffin tin. Gently pour the clear gelatin in to the wells so that is just covers the shapes in the wells. Refrigerate overnight to allow gelatin to get set. 8. Unmold the Halloween Jello Shots (refer to Step 4) and serve.